A simple fruit cobbler topped with vanilla ice cream and homemade bourbon caramel sauce. The filling for this cobbler isn’t really sweet, which makes it the perfect foundation for an easy summer dessert. The crumble adds a sweet crunch….I think it’s my favorite part of this dessert. I ground my oats for a smoother texture, but still keeping the nutty flavor the oats give. I knew when I was making this cobbler that a bourbon sauce would top it off nicely. Add a few scoops of ice-cream, some toasted pecans, and you have the perfect summer sundae. 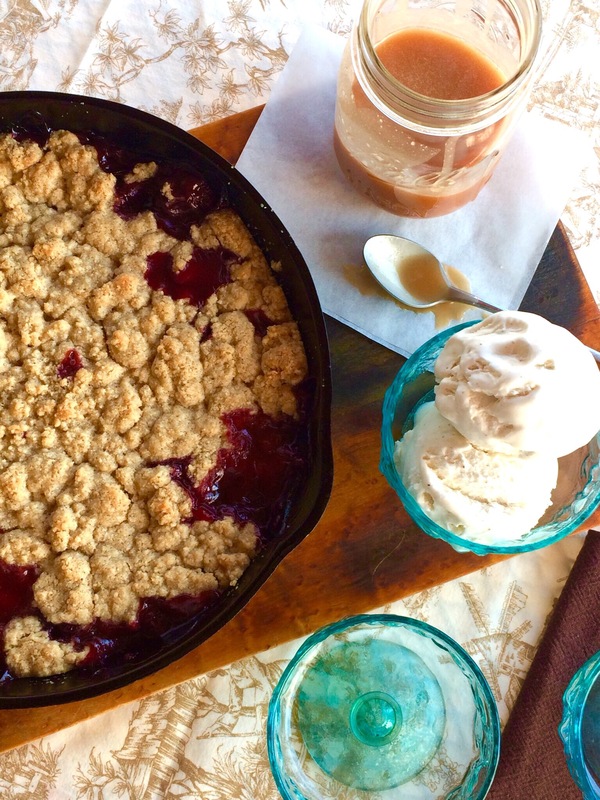 1)I used an 8-inch cast iron skillet to bake my cobbler. If you don’t have one, you could use a 9-inch square baking dish. 2)I know that making caramel can be intimidating, but it’s really simple. Keep your eye on it to make sure it doesn’t burn. Make sure your heavy cream sits out before adding it in. I sometimes place my heavy cream in the microwave for about 20-25 seconds…just enough to get the chill off. 3)I used two cups of fresh peaches and two cups frozen, because that’s just what I had on hand. 4)I use Evan Williams Kentucky Bourbon Whiskey…. it’s one of the cheapest. 5) You can serve this cobbler as soon as it comes out of the oven, or let it cool to room temperature. Preheat oven to 375 degrees F. Spray a 8- inch cast iron skillet with non-stick cooking spray. In a large bowl, gently combine the peaches, blueberries, sugar, cornstarch, cinnamon, lemon juice, and vanilla. Pour mixture into prepared skillet. Now prepare the crumble…add the flour and oats to a blender, and blend until oats are ground into a flour. Add in sugar and salt and pulse. Transfer to a large mixing bowl. Cut cold butter into small cubes and add to bowl. Use a pastry blender or a fork to blend butter into the dry ingredients. Continue to blend until the mixture resembles course crumbs. Add in the heavy cream and mix until just combined. Sprinkle crumble evenly over the top of the filling in the skillet. Place the cast iron on a baking sheet and bake in preheated oven for 30-40 minutes, or until the fruit filling is bubbling around the edges and the top is a golden color. While the cobbler is baking, prepare the bourbon sauce…simmer the sugar and the water on medium heat for about 12-15 minutes, or until it reaches a deep amber color. Watch very closely so that it doesn’t burn. DO NOT stir the pan. You can swirl the pan,but be very careful. Once it has turned a deep amber color remove the pan from the heat and slowly, very slowly add in the room temperature heavy cream, stirring vigorously while you pour… it will be very hot. Add in about 1/4 teaspoon of salt. Allow the sauce to cool a little before adding the bourbon. Transfer the sauce to a mason jar and store in the refrigerator. Once the cobbler has finished baking, you can serve it right away! Top with a few scoops of ice cream, a generous drizzle of bourbon caramel sauce, and a sprinkling of toasted pecans. Enjoy!